For the richest, purest tone and exceptional sustain, our slides are individually machined from a solid billet of the highest-quality marine-grade 316L stainless steel. The playing surface is lovingly polished by hand to a perfect mirror sheen, for a silky-smooth feel and minimal string noise. Hard, dense and durable, our slides combines the warmth associated with metal slides with the character usually attributed to glass slides, for a responsive tonal palette. No other slide combines the innovative design, no-compromise materials and engineering and fastidious attention to detail of a Wolfram slide. ... a person who practices or performs any of the creative arts. We have distilled the essence of our flagship tungsten carbide Martin Simpson Signature Slide into the high-peformance, affordable Artist Series Signature Slide. 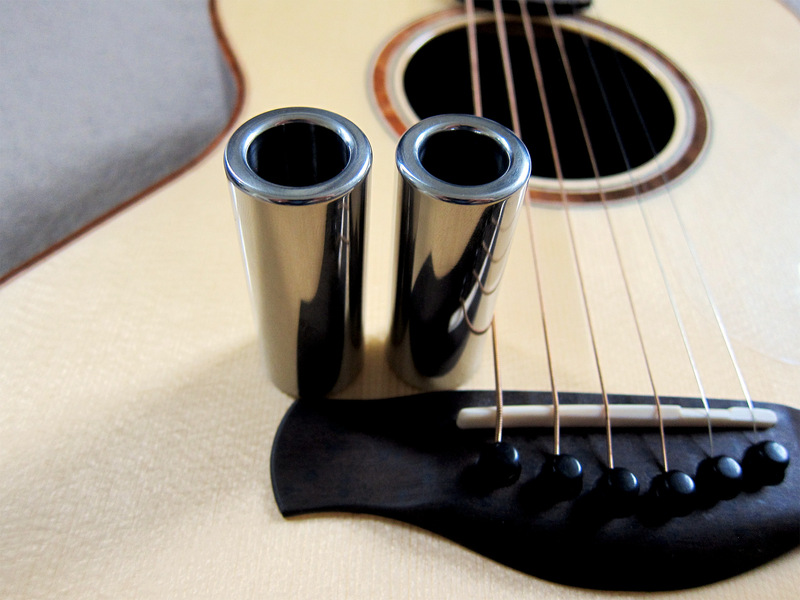 Machined from a solid billet of marine-grade stainless steel to exactly the same design and quality standard, then polished by hand to a smooth, mirror finish, these slides are engineered to extract the maximum possible tone performance from stainless steel. 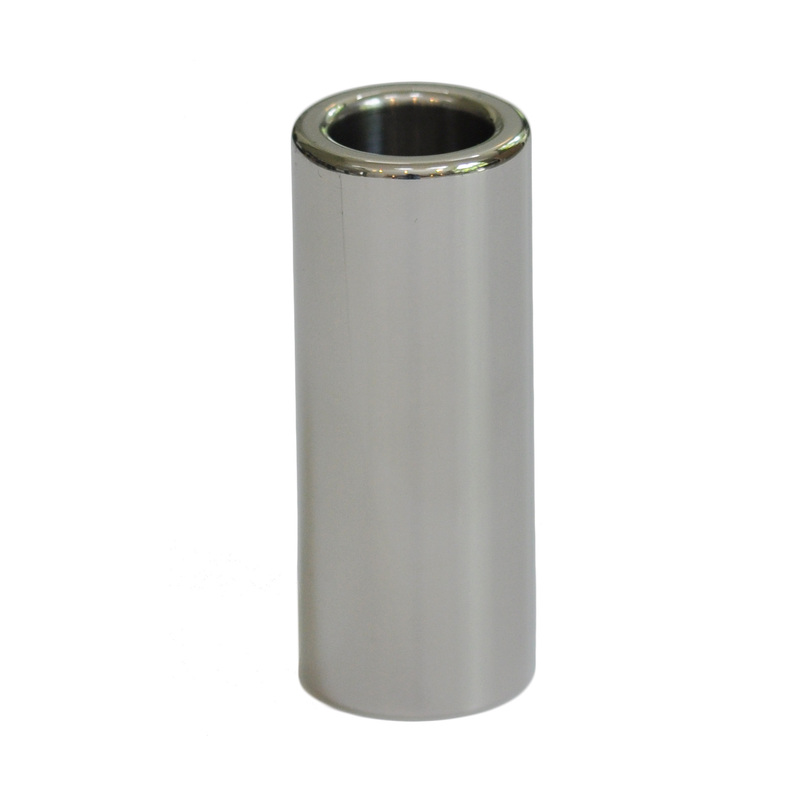 The inner bore is tapered, so the slide is thicker and heavier at the fingertip. This balances the mass towards the end of the slide, where it is needed for exceptional single-note tone and sustain, without making the whole slide too heavy and bulky. The taper also means the slide follows the shape of your finger, for the most comfortable fit and feel possibe. The straight outer surface is hand-polished to a mirror sheen, for the smoothest possible playing experience. 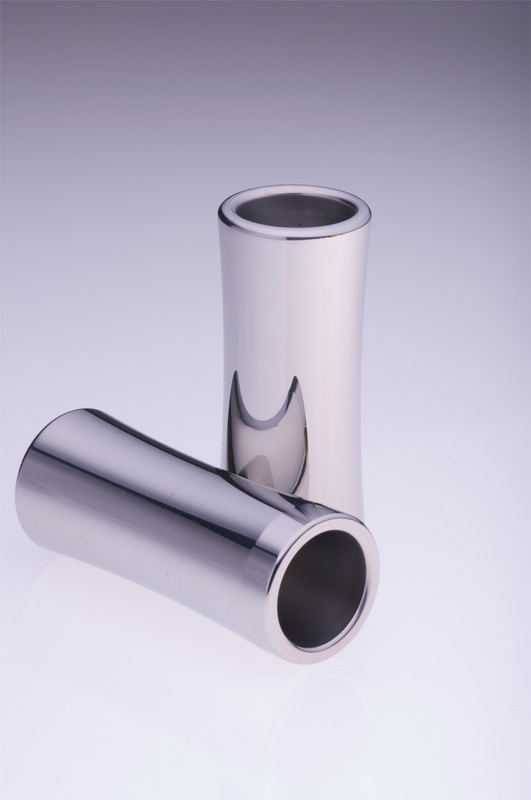 The precisely radiused and polished ends combine function and aesthetics. The thick end of the Martin Simpson slide features our signature compound edge radius - a combination of two precision-cut radii a central flat section, for a silky-smooth glide across the strings while keeping as much of the slide length 'in play' as possible. As well as enhancing the beauty and feel of the slide, they are a playing surface, making sensitive interaction with the strings possible for techniques such as hammer-ons and pull-offs. Long enough to cover all the strings, with the weight balanced towards the fingertip, the Martin Simson Signature Slide is an amazingly versatile tool. At 106 grams, it is heavy and dense enough to extract a beautiful note with very little pressure on the string, making it suitable for use on any guitar - even with light strings and a fingerstyle setup. Martin himself uses his Artist Series Signature Slide to great effect on acoustic guitar. The core tone is very balanced, with a solid fundamental - especially from the wound bass strings, which can often sound weak played with a slide - and a great deal of warmth. Because it engages with the string so well, it is very responsive to your attack and playing style - unlike many lighter slides, it really brings out tonal character of your guitar. In play, the slide feels comfortable and agile, excelling at everything from lyrical melodic lines to fast blues rhythm and lead passages. Martin reveals his tips for great slide technique, tone and guitar setup in our exclusive guide, free with every Martin Simpson Artist Series Signature Slide. 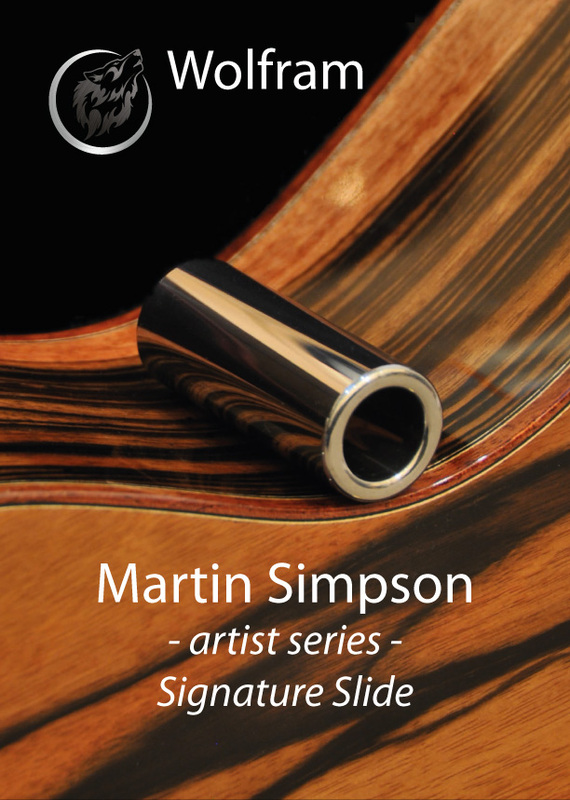 The Martin Simpson Artist Series Signature Slide is available in two sizes, medium and small. The unique tapered interior follows the shape of the finger and makes for a supremely comfortable fit on a wide range of finger sizes. The medium and small size slides are balanced to have exactly the same weight (106 grams), so you lose nothing in tone between the two sizes. ... agreement or harmony between people or groups. When playing a guitar with a tight fingerboard radius, it can be difficult to cleanly barre across all six strings, particularly if you play with a relatively low action - you will tend to press the outer bass and treble strings into the frets before the slide has properly engaged with the middle sttrings. This can be a particular problem with electric guitars, and may previously have required a guitar with an action set specifically for slide. The outer surface of Wolfram Concord is concave, machined to a precise 320mm (12.6") radius, enabling it to engage more naturally with the strings across the curvature of the fingerboard. A curved surface can compromise fine control over single-note work, particularly when playing near the tip, so Wolfram Concord retains a 6.5mm straight section at the end, blended seamlessly into the concave section. The tip also features our signature compound end radius, combining two precision edge radii and a central flat section, for a silky-smooth glide while keeping the maximum length of slide 'in play'. 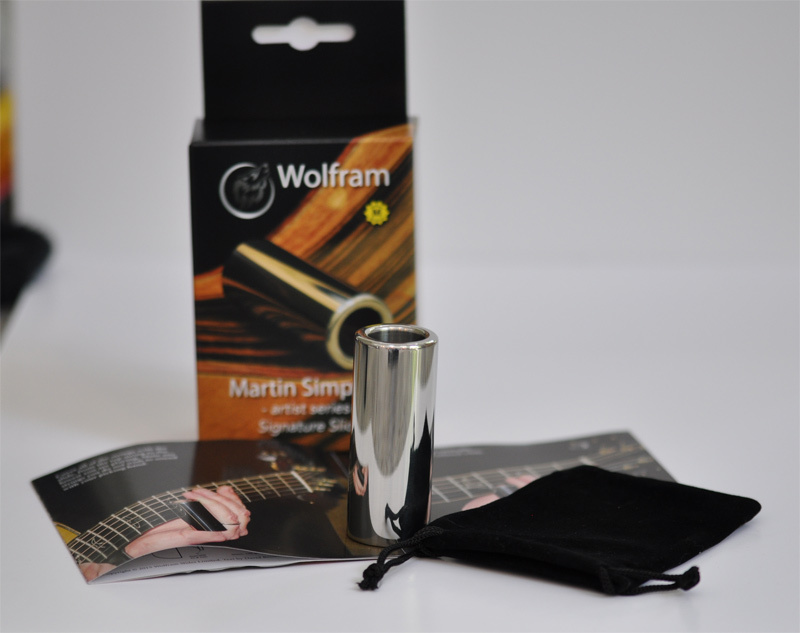 Wolfram Concord is a versatile slide, perfect for use on both acoustic and electric guitars with a tight fingerboard radius of 12" or less. At 84 grams, Wolfram Concord has sufficient mass to obtain a great tone from acoustic guitars, while remaining light and agile enough to be used on electric guitars without requiring heavy strings or a very high action. The core tone is sweet, with plenty of sustain - particularly on single-note licks and passages played with the tip. Wolfram Concord is currently available in one Medium size, with a 19mm inner diameter. 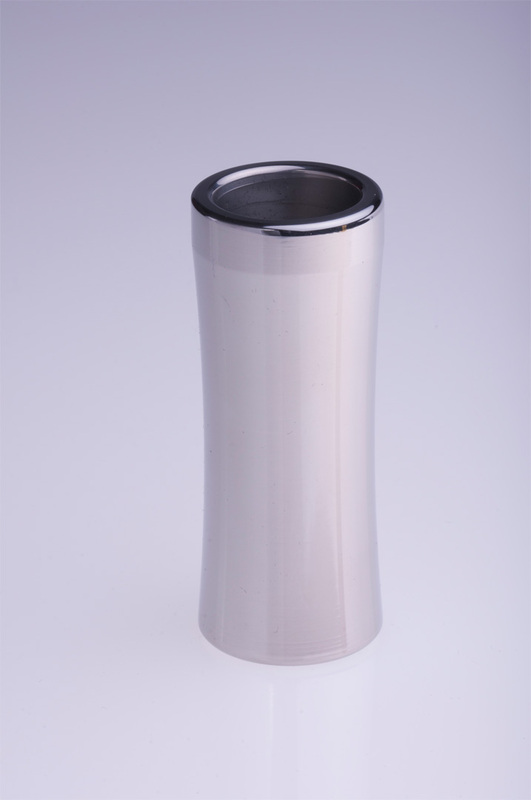 The ovrall length is 63.5mm.